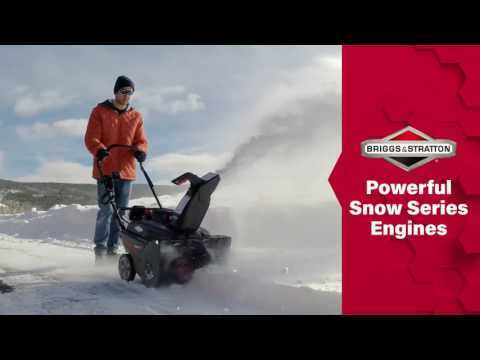 Equipped with easy-to-use push button start, a powerful Briggs & Stratton 950 Snow Series™ Engine and a convenient remote chute rotation crank, this snow blower has what it takes to tackle this winter’s snowfall with ease. The Snow Series engine was designed to deliver optimum power in extreme winter conditions to help you tackle the snowfall quickly and easily. Plus, it includes oversized controls for mitten-friendly operation. Easily change the height and distance snow is thrown with a simple squeeze of the chute-mounted handle. The wear-resistant rubber edged auger cleans snow down to the pavement and helps propel the snow blower forward. Easily rotate the chute 200 degrees from left-to-right with the remotely located chute rotation crank. Push button electric starting makes for quick and easy starts down to -20°F***. One-piece auger housing with ball bearings provides extra long life. More maneuverable and easier to control size - plus it saves space in your garage or shed. *All power levels are stated ft.-lbs. gross torque at 2600 RPM per SAE J1940 as rated by Briggs & Stratton. **Capacity and throwing distances can be greatly affected by conditions. ***See Operator's Manual for complete warranty details.